This Earth Day event seeks to create a heightened awareness of the importance our individual actions have on the environment. 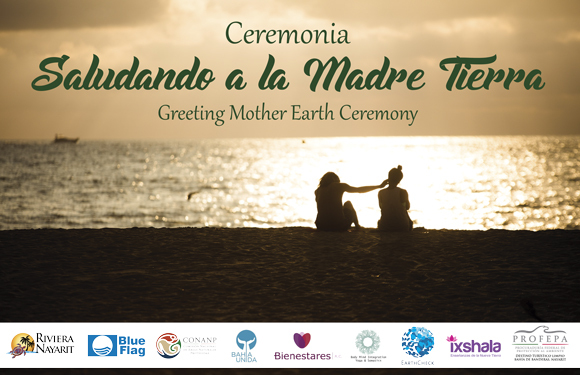 This year Earth Day falls on Saturday, April 22nd and the Riviera Nayarit is preparing to celebrate the occasion with a Greeting Mother Earth Ceremony. The event starts at 7:30 p.m. in Nuevo Vallarta at the Beach Club owned by the Bahía de Banderas Trust (Fibba, by its acronym in Spanish). The activity is an interactive contemplation of our relationship with the planet and the importance of caring for it as part of our own personal journey of wellbeing. Access is free for the general public and attendees are recommended to wear comfortable clothing. The idea is to take participants on a conscious awareness journey of their deep-rooted relationship with the planet via a series of activities guided by three professionals who have studied and specialized on this vision of oneness, where the action of one person affects their surroundings as much as themselves. This way the Earth is honored on Her day and it also becomes a call to the community to become more aware of each person’s capacity for change and the importance and need for daily activities to improve the environment. Miriam Ávalos de Ixhala leads the temazcal (sweat lodge) ceremonies as well as meditation, the seven elements ceremony and the circle of women. Ramiro Cuevas from Body Mind Integration offers sessions on body therapy, yoga and meditation. María Eugenia Huesca from Bienestares A.C. offers Gestalt therapy, a four elements ceremony and other actions for the integration into and care of our environment as part of our own self-care.